The Washington Fire Department recently received pet oxygen masks via a grant process through Invisible Fence. These masks will help first responders deliver fresh air via currently existing oxygen packs through masks developed for use with animals. The masks were delivered as part of a kit on Wednesday to the firehouse and includes a small, medium and large sized mask as well as information on how to perform CPR and or assist with pets on the scene of a fire. Pictured (L to R): Nicole Schoening with Isha representing Invisible Fence, Washington Fire Department Chief Tim Downing, firefighters Josh Moore, Ben Havens, Casey Coil and Matt Smith. 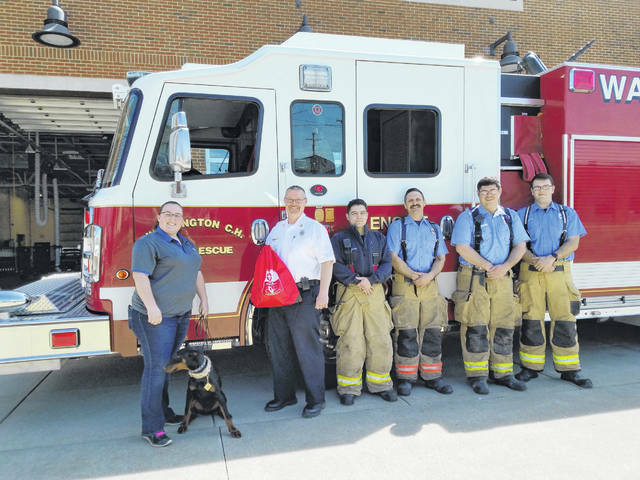 https://www.recordherald.com/wp-content/uploads/sites/27/2019/04/web1_20190403_142308.jpgThe Washington Fire Department recently received pet oxygen masks via a grant process through Invisible Fence. These masks will help first responders deliver fresh air via currently existing oxygen packs through masks developed for use with animals. The masks were delivered as part of a kit on Wednesday to the firehouse and includes a small, medium and large sized mask as well as information on how to perform CPR and or assist with pets on the scene of a fire. Pictured (L to R): Nicole Schoening with Isha representing Invisible Fence, Washington Fire Department Chief Tim Downing, firefighters Josh Moore, Ben Havens, Casey Coil and Matt Smith.